Representative Honours: Northern Ireland: 3 Full Caps (2013-14), 13 Under-19 Caps; 3 Under-18 Caps, 7 Under-17 Caps, 13 Under-16 Schoolboy Caps (2002). Club Honours: (with Puerto Rico Islanders) USL Commissioner's Cup Winner 2008; (with New York Red Bulls) MLS Supporters' Shield Winner 2013. 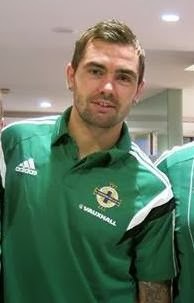 When New York Red Bulls' midfielder Jonny Steele was called into the Northern Ireland squad in November 2013 he became the first ever MLS-based player to receive such an honour. Indeed, no player featuring with a US club had been called-up since the days of the NASL, three decades earlier. Formerly a Wolves Academy player, Steele initially moved to the USA for a trial with Colin Clarke's Dallas Burn in 2003. He spent close to a decade, a short spell back home with Ballymena aside, plying his trade at various levels in North American soccer before finally arriving in the top-tier MLS with Real Salt Lake in 2012. He was released by RSL after a single season and looked likely to move closer to home, training with Cliftonville and coming close to a deal with an unidentified English League Two side. Steele remained in the USA to sign for MLS power-houses, New York Red Bulls where he played alongside former English Premier League stars, Thierry Henry and Tim Cahill. In his first season he assisted the team to Eastern Conference championship and, as the MLS team with the overall best regular season record, to the Supporters' Shield. 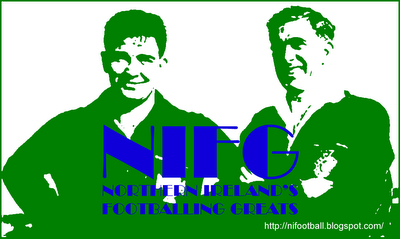 In all he scored five goals, mostly while playing as a left-sided mifielder. Surprisingly the Red Bulls lost out to Houston Dynamo in the play-offs. A member of the Northern Ireland Under-19 side that played in the 2005 European Championship finals as hosts, Steele also featured as the team finished as runners-up in that years' Milk Cup, scoring in a 4-2 final defeat by the USA. His form in the MLS throughout the 2013 season had seen him tipped for a call-up to the senior Northern Ireland squad, but it was only after the Red Bulls' exit from the play-offs that Michael O'Neill was willing to include him in the squad to face Turkey in a November friendly. On his first international call-up Steele noted: "Playing for your country is an honour and it's something I've always wanted to do and if I get that opportunity, I'm going to be hungrier than I've ever been." Having added further caps to his name during Northern Ireland's 2014 summer tour of South America, Steele was on the move again in July 2014, moving to play in Australia with Newcastle Jets. Summary: 0(3)/0. Won 0, Drew 0, Lost 3.